Stoke City and Bosnia goalkeeper Asmir Begovic believes football associations should be handed tougher punishments when players are racially abused. The Serbian FA rejected claims of racism following the Euro 2013 Under-21 play-off against England. 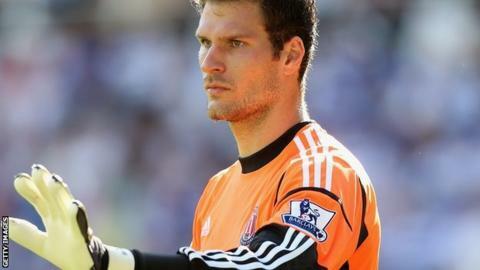 "Financial punishments are not as big a deal to most countries, certainly to bigger FAs," Begovic told BBC Sport. "Maybe teams should have to forfeit games or lose points - which means everyone suffers - so people learn." Both the English and Serbian associations were charged by Uefa over their players' behaviour towards the end of the match, with the Serbs also facing action for alleged racist chanting by fans. In 2007, the Serbian Football Federation was fined £16,000 at the Under-21 European Championship in Netherlands after their supporters racially abused England defender Nedum Onuoha. Bosnia international Begovic, 25, was disappointed with a statement released by the Serbian FA last week, which claimed a connection between the on-pitch scuffles and racism had "absolutely no ground" and blamed England's Danny Rose for the clashes because of "inappropriate, unsportsmanlike and vulgar" behaviour. "The comments from the Serbian FA are a huge shame," added Begovic. "Hopefully the authorities will take the right actions to punish that kind of behaviour and the individuals will be disciplined." Despite high-profile racism cases in the Premier League involving Liverpool's Luis Suarez, who was given an eight-match ban for abusing Patrice Evra last season, and Chelsea's John Terry, handed a four-match ban for comments towards Anton Ferdinand, Begovic does not feel there is a major problem in England. He added: "Here in England the situation is very good. There are not as many incidents as there may be in other countries but hopefully they can get rid of it all together. "It is difficult to handle these situations because people in other countries may not be as educated about the racism issue as they are in this country and may not see it as such a foul thing as we do." Former England defender Sol Campbell agrees with Begovic and has called on Uefa to start docking points for racist abuse. "There are fines, but I think points have to be taken," he told BBC Radio 5 live's Sportsweek programme. "If you keep knocking six, nine points off, they will start to wake up." Campbell said that he would love governing bodies Uefa and Fifa to act, but added: "I honestly believe they're not going to do anything."